We’re here to sweeten the deal this Valentine’s Day. 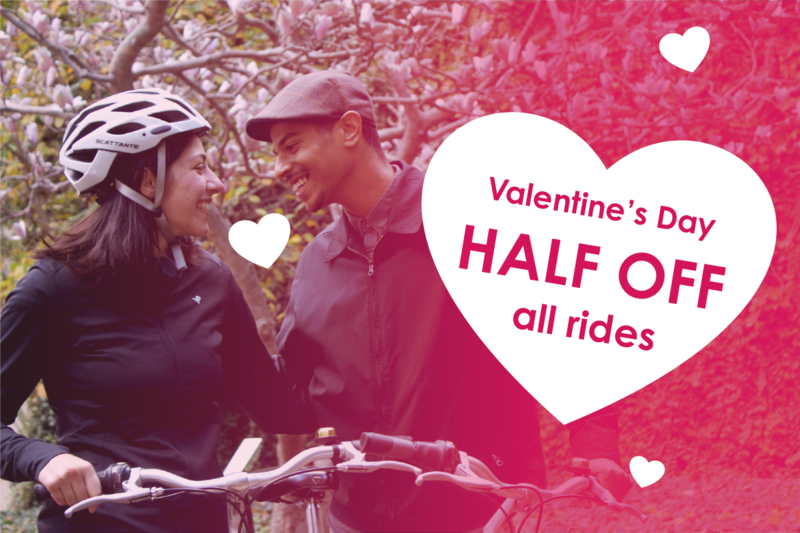 To help you move forward on your journey of romance, Healthy Ride is making all rides half off on Valentine’s Day (Feb 14), which means two for the price of one. Simply register and ride, no promo codes or vouchers necessary. Just a reminder, you can rent up to 4 bikes on one account. Not sure how to make a great first impression? Skip the usual first date ideas and go for some memorable bike trips with that new cutie. Take your date on a cat cafe quest: start at The Black Cat Market in Lawrenceville and then ride down Butler to Penn until you reach Colony Cat Cafe. Or take them on a curiosity cruise: explore the beautiful historic Mexican War Streets and end your ride at whimsical Randyland on the North Side. Or take a two-player trip on the Southside: take a ride along the Eliza Furnace Trail and finish at Victory Pointe Arcade and Gaming Cafe. A great way to start a budding romance (pun absolutely intended) is to immerse you and your date amongst the beautiful flowers at Phipps Conservatory. Continue your nature journey by riding through the winding roads of Schenley Park, then end at the Carnegie Library of Oakland to exchange favorite books and movies. There’s nothing like dinner and a show in the Cultural District! Before dinner, take a sunset ride by grabbing bikes by the Andy Warhol Bridge (lovers have been known to place locks on the three sister bridges…just saying), then take the ramp down to ride along the Three Rivers Heritage Trail. Once you’ve worked up an appetite, avoid the hassle of finding parking by biking to a romantic meal with your significant other at one of the many restaurants downtown has to offer. Sometimes all you need to have a romantic time is a bike, a partner, and a view. Point State Park and the North Shore trail have some fantastic panoramas of the city, and it’s better explored by bike! Park on the North Shore, explore the North Shore Trail, and ride over the Fort Duquesne Bridge to Point State Park. If you’re feeling extra adventurous, ride across town to the Monongahela Incline and park your bikes at the base of the incline (you can temporarily lock your bikes to themselves without a station). Take in the sights along Mount Washington and return to your bikes when you’re ready to come back down from the clouds.